0. Backup, Backup, Backup : You should clone or copy your existing Yosemite partition. I cloned it to another partition in same PC to share the same Clover bootloader. Notice: Following steps are my trial and errors to install El Capitan, you can refer this by your own risk & responsibility. No guarantee for you to make it work by following same procedures. Please stop here if you can't do that it by your own responsibility. 1. Clover bootloader : Upgrade it to the latest, but I selected 3276 because some of unknown issues for 3280 for me. You need to update Clover Configurator to the latest too. Updated on 30-July.2016: You can click drvier64UEFI to include all kext files. And, check UEFI boot only & EFI Clover only when you create EFI partition in separate like me. 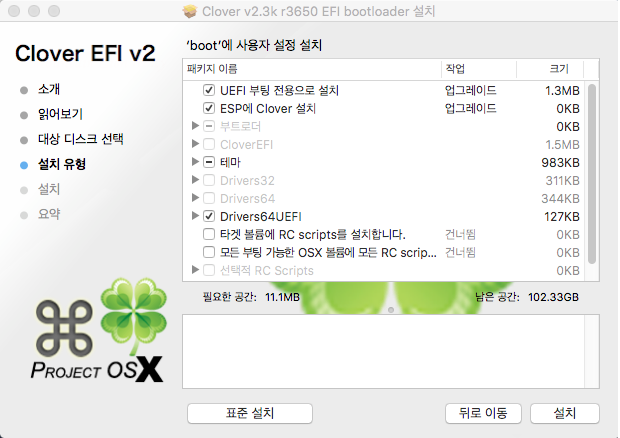 If you install Clover EFI in ESP but don't check ESP Clover option, your install would be failed. FYI, I installed Clover 3650 without issues. You should mount EFI at first to update config.plist file, go to Mount EFI, and select Mount EFI partition. disk0s1 is EFI partition for me. Then select the config.plist file at File -> Open, EFI -> Clover folder in sequence. All you need to update are 1. BooterConfig and CstActiveConfig at RtVariables like this : 0x28 and 0x3. You need to check if new Clover bootloader is working with your exisiting Yosemite before starting El Capitan. That's why I turned on Verbose (-v). 3. Enable HDMI sound of NVidia GTX 660 after installation : please run audio_cloverALC-110.sh at following site after downloading and decompression. No need to select "Enable HDMI of Intel CPU" but need to select ALC887 for B75M-D3H mainboard, but this enables HDMI sound of GTX 660 too for me. Added on 30-July.2016: If your HDMI Audio doesn't work after installing latest Clover, then please check if NVAudio.kext file exists in /Volumes/EFI/EFI/CLOVER/kexts/10.11/ even though audio_cloverALC-110.sh executed. You can copy it from ../10.10/ to ../10.11/ folder. That's all! You finished major steps to install El Capitan on Gigabyte B75M-D3H. FYI, I failed to upgrade my existing Yosemite to El Capitan as I've done from Maverick to Yosemite due to unknown Kernel Panic issue. So I install newly on new partition after making backup of Yosemite into another partition. I will share any new fact findings from now on here. 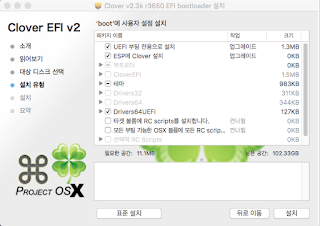 13-Oct. 2015 updated: I found out that files in driver64 & driver64UEFI are essential to boot Yosemite successfully with updated Clover bootloader. If you are in trouble like stuck in boot screen +++++++++++++++, or kernel panic, then please check files in these two folders in EFI partition. Most of the errors while booting are relevant with files in these two folder in my experience. Added on 22-Oct : I updated Mac OSX 10.11.1 natively by installing at AppStore without issue.